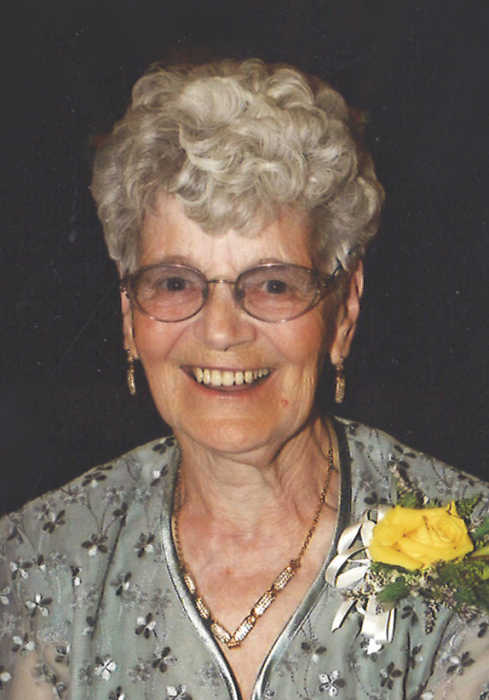 Mrs. Alfreda “Freda” Allsop of Lethbridge passed away on Tuesday, February 12, 2019 at the age of 94 years. Freda was born December 5th, 1924, in Lethbridge. She was the sixth child of father, Theodore “Ted” Erno and mother, May Hewitt. Freda is survived by her three daughters, Rhonda (Randy) Sorgard of Cobble Hill, BC, Darla Hughes of Lethbridge, AB and Terri (Russ) Paton of Millarville, AB; her dear sister-in-law, Flossie Erno; along with eight grandchildren, 5 great grandchildren, and several step children and their families. Freda was the last of her siblings to pass and was predeceased by her first husband Charles H Shepherd and her second husband, Albert E Allsop. Freda was proud to have lived her entire life in Lethbridge. She took commercial subjects in high school, which lead to her employment for the Department of Transport and Lethbridge Building Supplies. Freda made family a focus in her life. She particularly loved babies, and they loved her back. She enjoyed singing, knitting, writing letters, and board games. She loved to laugh and had an amazing smile that we all will never forget. A Funeral Service will be held at 1:00pm, on Saturday, February 16, 2019, at FIRST BAPTIST CHURCH, 1614 5 Avenue South, Lethbridge, AB T1J 0W3, with Dr. Bruce Martin officiating. For those who wish, the family requests memorial donations to the Alzheimer’s Society, 1202 2 Ave S #40, Lethbridge, AB T1J 0E3.